Can you believe that this berry cleaned my clothes AND my dishes??!! I am so excited to tell you about soap nuts!! I was sick of all the chemicals in even the ‘green’ laundry detergents and both intimidated and not sure of the ingredients in the typical homemade recipes. Soap nuts are actually soap berries. 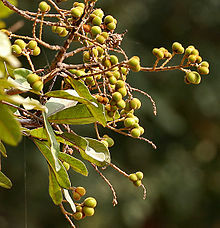 They grow on trees in India, Nepal, and China. (I’ve heard you can grow them here but haven’t gotten that far into it yet). The harvesters pick them and husk them. According to Wikipedia, they have been used for thousands of years for washing by Asians and Native Americans. They contain saponin in their husks that acts as a natural, gentle, organic laundry detergent. I even tried the soap nuts in the dishwasher this week and they did a great job. Ready for the one downside I’ve found? Sometimes I have a hard time finding the baggie in the midst of my clothes when they go into the dryer. I forgot to fish them out once, but they didn’t seem to be ill-affected by their extra trip, thankfully.